A year had passed since my last visit home to Maryland. Being that I was not visiting for very long, my mother had the idea that I should cook a dinner for family and friends. So after four trips back to the grocery store, realizing that there was only one oven in my mom's kitchen and six different things I had to cook in the oven, I crossed my fingers and hoped for the best. Eight hours later, I served dinner to twenty adults and a few rug rats. One of the main entrees that I served that night was a pork loin; to my surprise it was also one of their favorites because of how moist it was. So after sharing the recipe with my friends and family, I found out what one of the biggest problems when cooking pork is: the fear of undercooking it. Out of precaution, people may overcook the pork resulting in pork that is too dry, tough, or flavorless. I find that the simplest solution to this common mistake is to buy a meat thermometer. You can find them for about $6 at the grocery store; purchasing a meat thermometer will save you time by helping you not to have to play the guessing game of "is it done?" What we are going to do is sear the pork and bake it to a temp of 155°F. At the point the internal temperature reaches past 135°F, the temperature of the pork is sufficient to kill off trichinae. The recommended temp for pork is 165°F. The reason we are only cooking the pork loin to 155°F is because the meat continues to cook, once we pull it out of the oven. That is why you hear that you should let meat rest after cooking. Today's recipe is the one that was such a hit back home and has a touch of one of Erie's local wineries. This recipe may seem a bit overwhelming. The nice part is that it is very simple and has a lot of great flavors; the hardest part is waiting for it to bake. 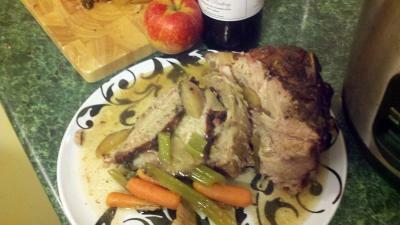 So let us start our journey to creating a succulent Cinnamon Spiced Pork Loin with Apples. First thing we have to do is preheat the oven to 350°F; this is one of the most common mistakes when it comes to baking. People start to prep and forget to turn on the oven. This way while we are prepping our oven is heating up and saving us time. Let's start with our dry rub! What we will do is take our brown sugar and pack it into our measuring cup (do not be afraid to pack down the brown sugar with your fingers in to the measuring cup). Now let's dump it into a small bowl. Add the rest of our dry ingredients. At this point, take a large frying pan and start heating it up at medium heat. Let's take the Pork Loin and place it on a plate so we can season it. Take our fresh peeled garlic cloves and with the pointy end just stuff the whole cloves throughout our pork loin spacing it out evenly. Now we rub the dry rub seasoning all over the Pork Loin covering it evenly. We are going to sear our pork on the frying pan, starting with the ends of the loin (searing the pork will both add color and help retain juices). Sear all the sides until we have a nice golden crust and then remove it from the pan. Now we are going to start with our meirpoix. A rustic chop is perfectly fine... just chop up celery and onions. If you want to save time instead of peeling and chopping carrots, just throw in baby carrots. With the apple, we are not going to peel them. Instead, just cut them up into slices. Take our meirpoix, apples in a roasting pan and place them over our Pork Loin. Now in the ½ cup of water, dissolve our pork bouillon (if you cannot find pork bouillon, I recommend using chicken instead of beef). Pour the mixture into the roasting pan. Add our Dutch Apple Wine. Place in the oven and let bake for two hours. As our pork is cooking you are going to notice an amazing aroma of the apples, the wine and spices mixing. Check to see if we reached an internal temperature of 155°F. Once we reach temp, remove the meat from the oven and let it rest for 15 minutes loosely wrapped in foil. Now place the pork loin on a cutting board and slice thinly. Pour some of our au jus over our pork loin as serving. Buen provecho!